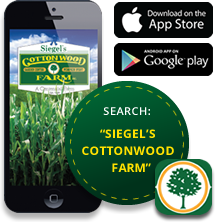 Chicago Now rated Siegel’s Cottonwood Farm’s Corn Maze #2 Chicagoland area corn maze! Siegel’s has two different mazes for you to choose from. They have a smaller 2 acre maze with an anti-bullying theme targeted at kids, and a larger 15 acre maze themed after Wrigley Field. They choose the Wrigley Field theme to celebrate the ballpark’s 100th anniversary, and because the farm is over 100 years old, making it a Centennial Farm. They have been hosting a corn maze since 1990, and next year will be their 25th anniversary. The construction of their maze begins in March when they decide on a theme, and then in July the actual maze construction begins when the paths are cut into the cornfield. Then, it is a waiting game as the corn grows taller for the fall festivities. Article source Chicago Now, September 22, 2014. Read the full article on Chicago Now.